Based on a novel by Daniel Woodrell, of whom I was previously unaware but intend to check out in the near future, Debra Granik’s engrossing, immersive thriller is my clear favourite of the Festival. A dark drama that convincingly depicts a rural, poverty blighted society normally only seen as monsters in horror films, it also features a remarkable lead performance by Jennifer Lawrence. Lawrence plays Ree Jolly, a 17 year old girl who – already responsible for her frail mother and two younger siblings – is told that her drug-dealing father has put their home up as security on his bail bond. Currently missing, he needs to show up for his court hearing or the family will be made homeless. Ree is obliged to undertake a dangerous quest to track him down – dead or alive. In this desolate mountain town, drug addiction is endemic and drug dealing seems to be the major industry and source of income. The people involved, whose identities seem to be at best an open secret, are less than pleased to have Ree asking questions, and it soon starts to look as though she may the next to go mysteriously missing. Watching the film, you can’t help but become angry that this young woman – who is demonstrably loyal, brave, occasionally droll – should be obliged to shoulder this kind of responsibility, even outside of the thriller plot. Looking at the older women in the film you see her likely future, and it’s infuriating. In a way, one of the most distressing scenes has Ree teaching her little brother how to shoot – distressing both because seeing small children handle weapons feels wrong, but also because you understand the lesson is actually necessary just so the family can continue to eat. The supporting cast features a seamless blend of local people alongside more familiar faces like Deadwood’s John Hawkes, Garret Dillahunt and Twin Peaks’ Sheryl Lee. All contribute to the feeling that this is a window onto a very real, specific world, one rarely explored in cinema. It’s being released in the UK in September by Artificial Eye, and comes hugely recommended. 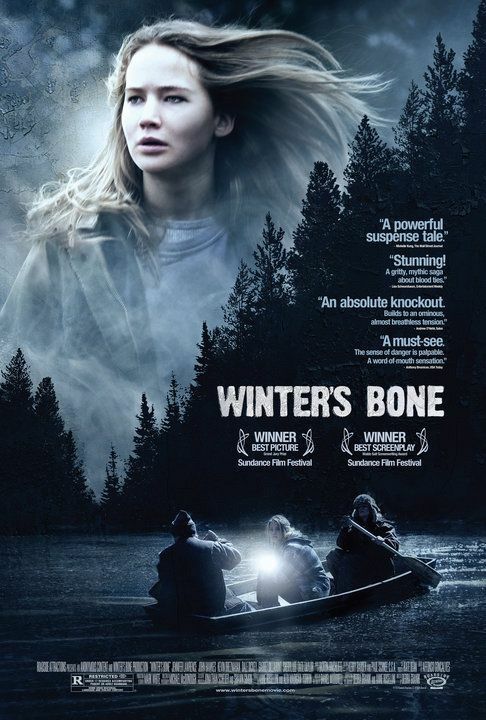 This entry was posted in Edinburgh, Festivals, Reviews and tagged Edinburgh Film Festival, EIFF, Jennifer Lawrence, John Hawkes, Winter’s Bone on June 23, 2010 by Gareth Negus.